Once upon a time I made my own radio show. I mean one that was actually mine, as opposed to someone else’s (I’ve made plenty of those). I only ever made one of these that actually aired. You might well ask, what’s the big deal? So you made one lousy radio show. Other people make their own radio shows all the time. What’s so special about this one? Nothing, really, except to me, and maybe those who helped me make it. It was, of course, a science fiction radio show. (This is me we’re talking about, after all.) It was a radio show about science fiction, featuring science fiction, hosted by a science fiction writer, and, on a meta-level, was science fiction itself. I still think it’s a cool idea. You see, I’ve loved science fiction ever since I was six years old. I’ve loved it since I stumbled upon this crazy low-budget television show from Japan called Johnny Sokko and His Giant Robot. 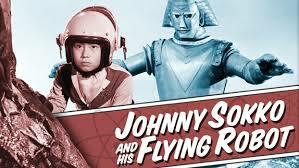 Johnny Sokko was extremely low budget and super cheesy, but it didn’t matter. What kid doesn’t want a giant robot as a best friend? Especially one that can fly, and clobber alien villains. Once I could read, it was Robert A. Heinlein’s juveniles (Have Space Suit Will Travel, Rocket Ship Galileo) and James Blish’s adaptations of the original Star Trek scripts (unlike most people, I read most of the original Star Trek television episodes before ever seeing one on TV), and then Isaac Asimov’s robot stories, and Cordwainer Smith (The Ballad of Lost C’Mell) and A. E. Van Vogt (Slan), and David Brin (The Postman), and on and on and on. It so happens that the CBC has produced some excellent science fiction and fantasy over the years. My pals Bill Howell and Matt Willcott both worked on Johnny Chase: Secret Agent of Space, a radio space opera that aired for two years (featuring music by the Canadian Progressive Rock band FM). There was also Vanishing Point, a science fiction anthology series produced by Bill Lane, and Nightfall, a supernatural/horror anthology series created and produced (for the first two seasons, at least) by Bill Howell. Working for the radio drama department, I aspired to join this select club. One day I mentioned this to producer Barbara Worthy, who doubles as a ball of enthusiasm. She promptly suggested we pitch a science fiction show, so off the top of my head I suggested a show based on science fiction magazines such as Analog, Asimov’s, and The Magazine of Science Fiction & Fantasy. I thought it would be fun to produce full cast radio adaptations of classic science fiction stories interspersed with interviews of science fiction luminaries and other fun, fantastical elements. Never dreaming that anything would come of it. James Roy happened to be Deputy Head of the Radio Drama Department at the time. Shortly after our conversation, Barbara marched into his office and pitched the idea. To my astonishment, he gave us a greenlight, providing a budget and a broadcast slot for a pilot. Barbara and I got right to work. The first order of business was finding a host for the show. Years earlier, I had worked on a couple of episodes of Ideas about science fiction produced by a young freelancer by the name of Robert J. Sawyer. Rob and I had a lot in common. We both loved science fiction and we were both interested in writing. Rob told me that he had a novel coming out soon called Golden Fleece. I told him I’d keep an eye out for it. Secretly, I thought that Rob Sawyer would vanish into the ether like so many other freelancers I’d met and never heard tell of again. After all, I was going to be the famous author, not him. But in the time it took me to write one novel (debuting this coming October, 2017, thanks for asking), Rob wrote twenty-three novels. He also won many (if not all) of the field’s major awards, such as the Hugo Award, the Nebula Award, and the John W. Campbell Memorial Award. In short, Rob became one of the most successful writers on the planet (of any genre, let alone science fiction). I read Golden Fleece, along with many of Rob’s other novels, and watched his growing success from afar with something akin to amazement. From time to time I would send him notes of congratulations. Rob always responded warmly. Once, he suggested I call him to chat, but he was already pretty famous by then, and I was kind of shy, so I didn’t. Until it became time to produce a science fiction radio show. I was still kind of shy. I emailed him instead. Rob, Barbara and I met to talk about it. We agreed that it would be modelled after classic science fiction magazines. That Rob would host. That it would include one adaptation and an original drama, the latter of which would be the first part of a potential serial. I would write and adapt the dramas and Rob would contribute an essay. Rob would also interview a science fiction personality still to be determined. Rob was enthusiastic and perfectly willing to collaborate. I wrote what I thought was a fun opening involving Rob taking off in a spaceship of his own to launch the show (this was the meta-science fictional component, which grew more elaborate in subsequent pilots). We picked Canadian science fiction author Nalo Hopkinson (Brown Girl in the Ring, Midnight Robber) to interview in between the two radio plays. Once we had part one of the original drama (Captain’s Away) and the adaptation (Tom Godwin’s The Cold Equations) in the can (more on them in separate posts) we recorded all the other bits, including SF poetry by Carolyn Clink (read by Barbara Worthy) and Rob’s intros and extros. I also included a brief station ID recorded by William B. Davis, aka “Cancer Man” on the X-files, which I’d asked Davis to record when we worked together on a radio adaptation of Margaret Atwood’s The Handmaid’s Tale. I had some corrections for Rob’s essay. I feared this was rather presumptuous of me, considering Rob’s track record of having written several award-winning, best-selling novels versus my track-record of having (at that point) sold a mere short story or two. We needed a name for the show. Early on I considered “All in a Dream”, a lyric from a favourite Neil Young song—I even wrote a draft of the script using that name—but even now, a decade and a half later, I cringe at the thought. Fortunately, somebody—probably Rob—suggested Faster Than Light, which, in three simple words, perfectly encapsulated what we were up to. You could shorten it to FTL and literate fans would still know what we were talking about. We all loved it instantly. Creating Faster Than Light was the most fun I’ve ever had making radio. I loved every single second of it. All the fussy producers I’ve ever worked with—and I’ve worked with some damned fussy producers—didn’t hold a candle to me on this show. Everything—every line, every level, every edit—had to be absolutely perfect. And it was, by the time I was done with it. Faster Than Light broadcast Sept 22nd, 2002 on Sunday Showcase (in mono) and again Sept 23rd on Monday Night Playhouse (in stereo). We had a listening party at my home. Barbara Worthy, Rob Sawyer, Rob’s wife Carolyn, my family and several friends attended. It was great fun, though I have one regret. 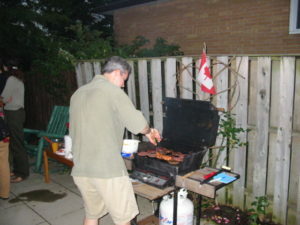 I happened to be watching my pennies at the time (public broadcasting, remember) so I purchased flimsy 4 ounce hamburgers to barbecue instead of nice plump 5 ounce burgers. What a cheapskate! Nobody complained, but I still wince every time I think about it. On the plus side, the show was well received by Rob and my friends. Yes, these are the cheap burgers I’m frying up during the FTL get together, which somebody thought necessary to record for posterity. The response from our listeners was even more positive. Faster Than Light did pretty good for itself. It was named a finalist for the Prix Aurora Awards 2003 for the Best in Canadian SF and Fantasy. 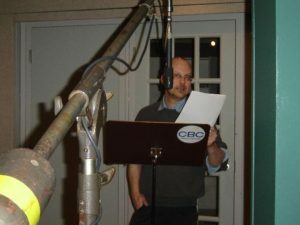 One of its elements, “The Cold Equations,” a full cast adaptation, was selected by CBC’s internal jury for the New York Awards. The show received an unprecedented response for the drama department. Many listeners wrote to convey unbridled enthusiasm for the show. Particularly gratifying was feedback from as far away as California and Australia, from listeners who tuned in over the internet. James Roy informed me that it was the biggest response any Sunday Showcase show had ever received. I would like to think that the response was a consequence of the effort we’d put into the show, and I’m sure that was indeed a factor—but I know it also had a lot to do with Rob Sawyer’s role in the production. Faster Than Light had been quite well promoted by Rob and his fans before the broadcast. I suspect that many of those who wrote in were already fans of Rob’s. Still, the feedback boded well. Everyone wanted more. Adrian Mills, the Director of Programming at the time, invited me into his office to talk about the show. He asked me what I thought of it. I told him honestly that I thought it was the best work I’d ever done in my life on anything. I was inordinately proud of it. I still am. We were asked to make a second pilot, and then a third, and even a fourth, but with each pilot the concept seemed to stray further and further from its original conception. In the end, I’m afraid the stars never quite aligned for Faster Than Light. I treasure the experience just the same. I became friends with Rob Sawyer and his wife Carolyn Clink. I learned how to adapt a short story into another medium. I got to write, mix, and broadcast an original drama of my own. I discovered that directing was a lot harder than it looked watching from behind a console. And I acquired a modicum of empathy for fussy producers. In a sense, Faster Than Light lives on. 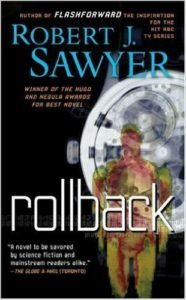 In the fictional universe of Robert J. Sawyer’s novel Rollback, published a few years later, Faster Than Light did become a regular series on CBC Radio. Where, for all I know, it continues to be broadcast to this day.